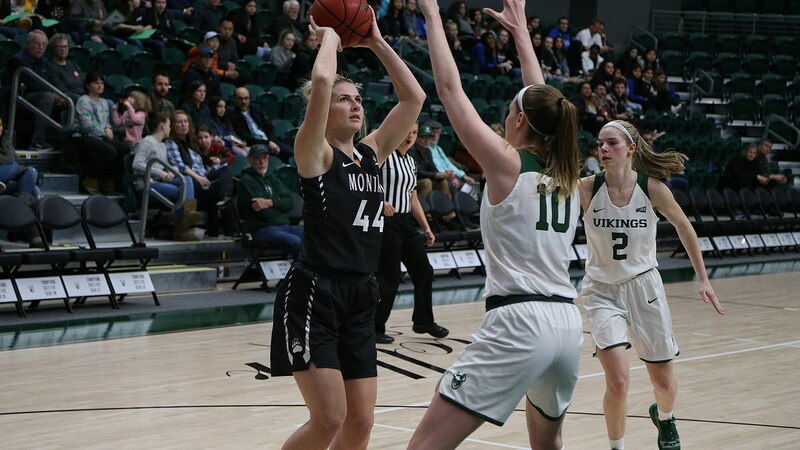 Portland State made its first six shots on Saturday and 10 of its first 11, and the Vikings never looked back, rolling to a 78-60 victory over Montana at Viking Pavilion. Portland State led 29-9 after the first quarter. And that was that. PSU led by 14 or more the game’s final 34 minutes. “When a team absolutely blitzes you like that, you’re kind of at a loss,” said coach Shannon Schweyen. “They came out ready to go today and we did not. Credit to them. They were lighting it. At least in the early going, “they” could have referred to Sidney Rielly, who scored 16 points in the opening quarter alone to set the tone for the game. She hit all six of her shots in the first quarter, four of which came from the 3-point line. After Portland State jumped out to a 12-4 lead, Rielly scored 14 points in less than five minutes as the lead ballooned to 20 before the game was 10 minutes gone. “She’s a great shooter, and it was like we were surprised she was going to shoot it,” said Schweyen. “It’s disappointing we didn’t adjust to that better. It was like we were on her but not close enough to her. Rielly would add just three more points after the first quarter to finish with a game-high 19, but her work was done. Her teammates just followed her lead. Courtney West scored 15 points, going 7 for 7, and Ashley Bolston didn’t miss a shot either, going 4 for 4 to finish with an 11-point, 10-rebound double-double. Portland State took 28 shots in the first half and made 21 of them. The Vikings led 50-30 at the break. Montana turned the ball over a season-low eight times, but the Big Sky’s top shooting team finished at 31.8 percent, a season low. “On top of what they were doing, we got a lot of good shots and nothing could go down,” said Schweyen. “They are big and change shots, but we had a hard time getting anything to go down today. The damage was done and it was irreversible, but there were bright spots. Five players scored between nine and 13 points for Montana, and the Lady Griz held Portland State to 39 percent shooting in the second half and outscored the Vikings over the final 30 minutes. But nothing could undo those opening 10 minutes. “My bad for not going zone earlier. I thought the zone was really good and much more effective for us,” said Schweyen. “That slowed them down a lot. Carmen Gfeller led Montana with 13 points off the bench on 6-of-9 shooting. Her performance came two days after going for 12 points and seven rebounds against the Hornets. Gabi Harrington had 12 points, her third consecutive game in double figures, McKenzie Johnston added 11 points and a team-high four assists, and Katie Mayhue finished with 10 points on perfect shooting from the arc. She went 7 for 12 from 3-point range on the road trip. Montana will now return to Missoula for an important three-game home stand. After hosting Eastern Washington on Thursday, the Lady Griz will play back-to-back Saturday games against Northern Colorado and Idaho at Dahlberg Arena. Northern Colorado sits atop the Big Sky standings and is the only unbeaten in the league after winning at Idaho on Saturday. The Vandals were the preseason Big Sky favorites. The Bears are 3-0 and are trailed by five one-loss teams. Montana, Idaho, Idaho State and Montana State are all 3-1, Portland State is 2-1.